Pain causes a reflex withdrawal from any stimuli that can cause actual or potential tissue damage. It is frequently an early symptom of a disease process and is often the impetus for a patient to seek medical treatment. In many disorders where pain appears late, patients are at risk of developing complications without getting noticed. 'Congenital insensitivity to pain' is a rare disorder. Traumatic injury and self-mutilation is an almost consistent feature in this disorder. Injuries most frequently involve the oral and paraoral structures such as teeth, lips, tongue, and also ears, eyes, nose, and fingers. Oral manifestations may be the presenting complaint. Thus, it is important for the clinicians to be familiar with the condition. The present article provides a brief review of the condition and its insinuation in dentistry. Congenital general pure analgesia (Dearborn, 1932). Congenital universal insensitiveness to pain (Ford and Wilkins, 1938). Congenital universal indifference to pain (Boyd and Nie, 1949). Congenital absence of pain (Winkelmann, 1962). Pain should be absent from birth. The entire body should be affected. All other sensory modalities should be intact or minimally impaired and tendon reflexes present. All HSAN that produce abnormalities of pain sensation have involvement of the small-diameter C and A-delta fibers that transmit pain sensation. Although each HSAN is characterized by a different pattern of sensory and autonomic dysfunction, the field is currently moving away from classification based on clinical presentation towards the underlying genetic abnormality. Trauma to tongue leading to chronic nonhealing ulcers. Reduced mouth opening due to thick fibrous scars as a result of severe cheek biting. Premature loss of teeth due to self-extraction or dental sepsis. Insensitivity to dental pain, leading to space infections or dental sepsis. Loss of taste sensation, especially failure to identify sweet taste. Increased incidence of fractures and osteomyelitis of jaws. Increased incidence of traumatic ulcers of oral mucosa. Dryness or fissuring of vermillion border of lip due to anhidrosis. Severe dental attrition and cervical abrasions. Erosion of teeth due to regurgitation of fluids because of defective gastroesophageal motility. Abnormal gastroesophageal motility may cause feeding difficulties and recurrent vomiting in children. Recurrent fever may lead to xerostomia and increased incidence of dental caries, oral infections such as candidiasis. Patients are sensitive to thermal stimuli, but they may not be aware of the pain normally associated with high temperatures, thus leading to burns of oral mucosa especially palate, due to hot food or beverages, etc. Elimination of sharp surfaces of the teeth by grinding (enameloplasty) or addition of composite restorations. Use of mouth guards or tongue guards and other appliances to prevent injury to the tongue. Thus, the dental team should therefore be involved in the management of these patients as soon as the diagnosis is made and careful monitoring should continue throughout the lifetime of the patient. Congenital insensitivity to pain is a rare disorder in which oral manifestations may be the presenting complaint. The most important characteristic is the self-mutilating behavior, which leads the child to oral ulcerations on lips, tongue, and cheeks and also finger and hand biting. This condition represents a challenge to the dentist, who is concerned with the early intervention, and as the patients are below normal in intellect, development, and psychological aspects. As oral ulcerations and premature loss of teeth along with signs of self-mutilation may represent early manifestations of this rare disorder, clinicians should always keep in mind that these clinical signs can be because of HSAN. An early diagnosis and appropriate dental approach is indispensable to avoid severe injuries to the oral and other regions of the body. 1. Elna MN, Louise AO, Robert D. Congenital insensitivity to pain: An update. Pain 2003;101:213-9. 2. Jonathan B, Padraig F, Webb D. Congenital insensitivity to pain - review and report of a case with dental implications. Oral Surg Oral Med Oral Pathol Oral Radiol Endod 2006;101:58-62. 3. Littlewood SJ, Mitchell L. Dental problems and management of patient suffering from congenital insensitivity to pain. Int J Pediatr Dent 1998;8:47-50. 4. Auer-Grumbach M, Mauko B, Auer-Grumbach P, Pieber TR. 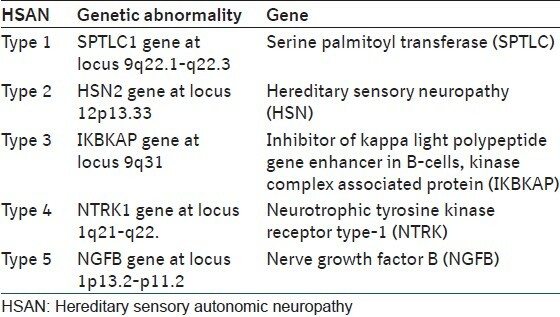 Molecular genetics of hereditary sensory neuropathies. Neuromolecular Med 2006;8:147-58. 5. Miranda C, Di Virgilio M, Selleri S, Zanotti G, Pagliardini S, Pierotti MA, et al. Novel pathogenic mechanisms of congenital insensitivity to pain with anhidrosis genetic disorder unveiled by functional analysis of neurotrophic tyrosine receptor kinase type 1/nerve growth factor receptor mutations. J Biol Chem 2002;277:6455-62. 6. Amano A, Akiyama S, Ikeda M, Morisaki I. Oral manifestations of hereditary sensory and autonomic neuropathy type IV. Congenital insensitivity to pain with anhidrosis. Oral Surg Oral Med Oral Pathol Oral Radiol Endod 1998;86:425-31. 7. Paduano S, Iodice G, Farella M, Silva R, Michelotti A. Orthodontic treatment and management of limited mouth opening and oral lesions in a patient with congenital insensitivity to pain: Case report. J Oral Rehabil 2009;36:71-8. 8. Sezg NB, Hamamci N, Açkiran EA, Çelenk S, Ayna B. Congenital insensitivity to pain: A case report with dental implications. HK J Paediatr 2010;15:234-7. 9. Xia CS, Kafl D. Congenital insensitivity to pain: A rare encounter in Orthodontics. J Nepal Dent Assoc 2009;10:72-4. 10. Oddoux C, Reich E, Axelrod F, Blumenfeld A, Maayan C, Slaughenhaupt S, et al. Prenatal diagnostic testing for familial dysautonomia using linked genetic markers. Prenat Diagn 1995;15:817-26.